All evacuation and pre evacuation notices have been rescinded. Highway 69 is open. Jesper Joergensen, accused of starting the Spring Fire, has been formally charged with 141 counts of first degree arson, one count for each of the structures burned. 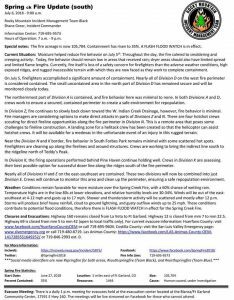 Official Spring Fire update, July 12. South part of fire is contained, overall containment 87%. NW perimeter of fire still not contained. Highway 69 remains closed to through traffic south of the Huerfano/Custer County line to mile marker 5 outside of Walsenberg. Local traffic only. Highway 160 is currently open but subject to periodic closures due to fire activity. Current information available at the cdot site. July 9, 2018 – 9:00 a.m. 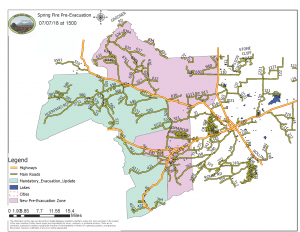 Hours of Operation: 7 a.m. – 9 p.m.
Special notes: The fire acreage is now 107,627. Containment has risen to 70%. 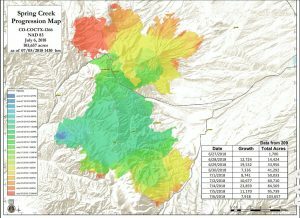 Current Situation: As containment percentages increase, crews on the Spring Fire (south) begin to focus their efforts on mop-up, repair of fire suppression activities, and backhaul (removing or relocating) of unneeded equipment. Utility companies are working to repair infrastructure within the impacted areas. Conditions remain hot and dry, with minimal potential for moisture and a possibility for lightning. While overall fire behavior is calming, spotting is still a potential in these conditions. As fire continues to consume interior fuels, smoke and some flame will still be visible in some areas. Many residents are returning to the burned area. 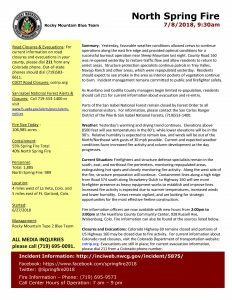 Fire management wishes to remind residents to stay on high alert for their own safety. There are still crews working in the areas, using heavy equipment and chainsaws. Residents may encounter “hazard trees” or snags – trees that are weakened from burning or hanging precariously on other trees. These trees may fall over without notice. There are various types of debris underfoot, and burned stump holes/ash pits are a tripping hazard and a burn hazard. Residents are also encouraged to utilize proper protective equipment when sorting through damaged property or burned landscape. This includes protective masks (N-95 or P-100), eye protection, heavy work gloves, long sleeves and pants, and sturdy boots. Division D is now completely contained, and crews are mopping up around structures. Crews in Division D will construct contingency firelines east of Highway 160 to support any burnout operations in Division RR on the North Spring Fire. Most of Division A is now contained, and crews are cleaning up the perimeter edge to complete containment of Division A in the coming days. In Division Z, the Smokey Bear and Flathead Hotshot crews performed firing operations late into the evening, contributing to the last critical components of containment in Division Z. Today, these crews will ensure this area stays secure. Crews in Division N have successfully completed the fireline. Today, crews will focus on mop-up and rehabilitation of dozer line. Division K and Division E are now considered fully contained. Crews in these divisions monitor, patrol, and work on rehabilitation. Weather: Conditions remain hot and dry, with the chance of wetting rain at 10%. Temperature may reach the upper 80s, approaching 90F in some areas. Higher elevations (above 8500 ft) will be in the high 70s to low 80s. Relative humidity lows are 12%. Winds will start out of the west-southwest early in the day at 6-9 mph with gusts up to 18 mph. The wind will shift and come from the east by late morning, blowing at 7-12 mph with gusts to 20 mph. Storm cells could produce outflow gusts up to 30 mph. Closures and Evacuations: Highway 160 is open in both directions. There is no stopping, parking, or standing outside of vehicles along the highway or shoulder from La Veta to Ft Garland. Please check www.cotrip.org for the most recent updates. Highway 12 is closed from mm 7 to mm 22.5. Highway 69 is closed from mm 5 to mm 42 (open to local traffic only). For current evacuee information: Huerfano County: visit www.facebook.com/HuerfanoCountyOEM or call 211 for in-state phone numbers or 719-583-6611 for out of state phone numbers. 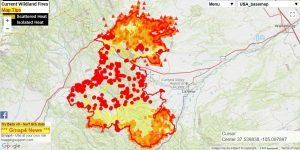 Costilla County: visit the San Luis Valley Emergency page: www.slvemergency.org or call 719-480-8719 between the hours of 10 a.m and 3 p.m. Las Animas County: https://www.facebook.com/LAS-Animas-County-OEM-1417285551649252/ or 719-846-2993 ext. 0. Social media identifiers are now #springfire for both areas, #southspringfire (Team Black), and #northspringfire (Team Blue). Evacuee Meeting: There is a daily 1 p.m. meeting for evacuees held at the evacuation center located at the Blanca/Ft Garland Community Center, 17591 E Hwy 160. The meetings will be live streamed on Facebook for those who cannot attend. 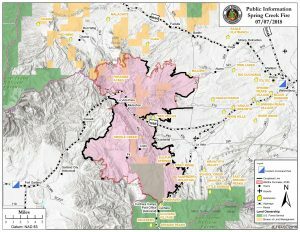 The Forest Service has issued their final update on the Adobe Fire. The fire remains at 85 acres and 95% containment. KLZR will provide updates on the Adobe Fire only if there are new developments. Highway 160 is currently open but subject to periodic closures due to fire activity. Latest information at cdot site. The Adobe Fire is 85 acres with 95% containment. Today 4 crews and 1 dozer are being released from the fire. Remaining resources are using hose lays and hand tools to continue mop up within the fire perimeter. US 160 has reopened … for the latest info please visit the official cdot site. US 160 was open for all of 1/2 hour. It has been closed once again due to increased wildfire activity. For the latest road closure information information please visit cdot site. Closed due to a nearby wildfire. Expected to reopen on Sat. July 7, 2PM. Use alternate route. Closed due to nearby wildfire. No estimated time for reopening. Closed due to a nearby wildfire. No estimated time for reopening. Limited local traffic. 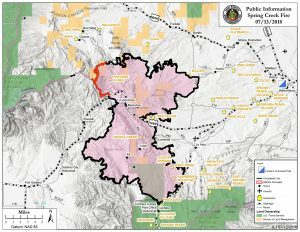 The Adobe Fire is 85 acres with 95% containment as of 7:30 am Saturday morning. Crews are using hose lays and hand tools to continue mop up within the fire perimeter. Due to the hard work by firefighters, both local and Forest Service, demobilization of resources will start soon. 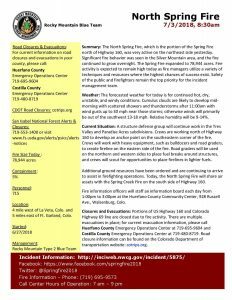 Here is the latest update on the North part of the Spring Fire. SOUTHWEST and SOUTHEAST COLORADO ― The Colorado Department of Transportation (CDOT) will reopen US Highway (US) 160/La Veta Pass in both directions on Saturday, July 7 at 2:00 p.m. US 160 has been closed since Thursday, June 27 from from Fort Garland, mile point (MP) 258, to La Veta, MP 294, due to the Spring Fire. CO Highway (CO) 69 will remain closed, in both directions, from 5 miles north of Walsenburg (MP 5) to the Huerfano/Custer County Line (MP 42). Local traffic will be permitted on CO 69 with proof of residence. CO 12 will also remain closed northbound and southbound CO 12 from CR 420 (MP 7) in La Veta to the summit of Cuchara Pass (MP 22.5). US 160 is closed in both directions over La Veta Pass between Fort Garland – La Veta due to a nearby wildfire. No estimated time for reopening. Possible alternate route: US 50 west of Pueblo to US 285. CO Hwy 12 is closed between the Cuchara Pass area – La Veta. CO Hwy 69 is closed between Red Rock Rd (5 miles west of I-25) and the Custer County Line. Road is open to local traffic only. The Adobe Fire is holding at 85 acres with 72% containment. There is a combination of dozer, hose lays and hand line on the fire. There was no aircraft used yesterday, however, crews used hose lays and hand tools to continue extinguishing hot spots within the fire perimeter. Increasing moisture is expected throughout the day with a chance of scattered thunderstorms early in the morning and late in the afternoon. Morning winds are expected from the southwest at 5mph shifting to the southeast in the afternoon. Temperatures on the mountain are expected to be in the low 70’s by this afternoon. Due to the continued efforts to suppress the Adobe Fire all pre-evacuations in both the Fremont and Custer Counties are now lifted. SECOM internet service has been restored to the valley as of 6:30 pm. Service speeds will be slow in the near term. Updates as KLZR receives them. The Adobe Fire was first reported at 2:00pm July 2, 2018 caused by lightning. 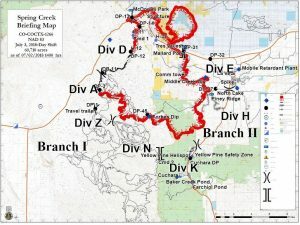 The Adobe Fire is located in the San Carlos Ranger District in the Northern Wet Mountains, Adobe Peak. Immediately, Wet Mountain Volunteer Fire Station responded followed by the Forest Service. 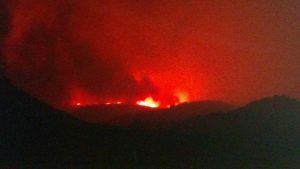 Adobe Fire resources included 4 air tankers, 3 helicopters, 5 hand crews, 5 engine modules, 1 water tender and 1 bulldozer.. The Fire is still estimated to be 85 acres with 0% containment. Today we are expecting increasing moisture with a chance of isolated thunderstorms early in the afternoon. Morning winds are expected from the west at 5mph and in the afternoon southeast winds are expected with gusts of 20 mph. There is a chance of lightning later this afternoon with possible outflow winds from thunder storms. Temperatures on the mountain are expected to be in the mid 80’s by this afternoon. 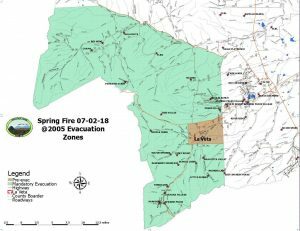 Pre-evacuations are still in effect south of county road 15 in the Freemont County to the Custer County line as well as three subdivisions Adobe Creek, Trinity Ranch and TV Hills in Custer County. When pre-evacuations are in effect this means that all residents in these areas should have essential possessions identified and ready to pack in the case a full evacuation is ordered. Residents should expect to see smoke throughout the day. As a reminder fireworks are always prohibited on Federal Lands and there are fire restrictions for the state of Colorado which include fireworks but, please have a happy Independence Day! If you have any questions regarding the Adobe Fire please email us at adobefire18@gmail.com or call 719-299-0574. US 160 is closed in both directions over La Veta Pass between Fort Garland – La Veta . No estimated time for reopening. Possible alternate route: US 50 west of Pueblo to US 285. Hwy 12 west of Trinidad is *NOT* a suitable alternate route. CO Hwy 69 is closed between Red Rock Rd (5 west of I-25) and the Custer County Line. Road is open to local traffic only. UPDATE ON THE SPRING FIRE: The fire, for Wednesday morning July 4th. 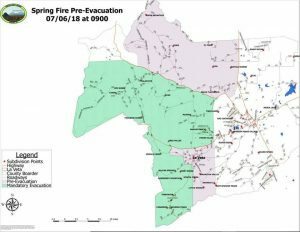 You can find the official report on the team Facebook page called “Spring Fire 2018”. 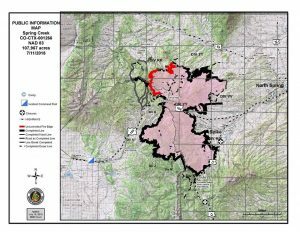 The fire stands at 94,093 acres, and burned in several directions yesterday. 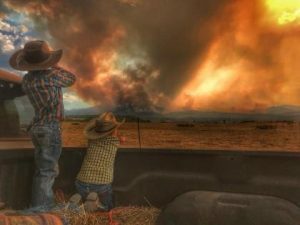 They are making progress on many fronts, but when the fire grows each day, it keeps the containment levels looking low. It moved on the north side from Silver Mountain to Sheep Mountain and burned in heavy fuels so you may have seen the red glow of that last night. There are two small sections of fire ahead of the main body that moved into the Sheep Mountain area, and the northern tip of that is still 6.5 miles or more from Gardner. They will be working on containment lines on the north side again today. The fire moved on the south towards the edge of Cuchara Valley, but so far lines held. 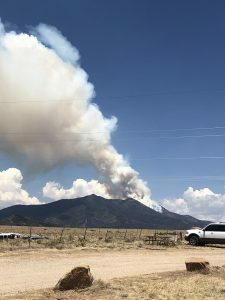 There were NEW PRE EVACUATIONS TO THE SOUTH EAST SIDE OF THE FIRE AS REPORTED HERE BY LAS ANIMAS OEM: A Pre-Evacuation Order is now in place for all residents in the area south of the Huerfano/Las Animas County Line south to County Road 42 and East to County road 21.7 and west to Highway12. This area includes all phases of Cuchara Pass Ranches, Timber Creek Ranch, Timber Ridge @ Cordova Pass and Spanish Peak Ranch Estates. Residents in these areas should start planning and preparing to evacuate, if the need should arise. The new PRE evacuation map is below. Today we will have lowered winds from the South, switching to East-Northeast winds later in the day, which could push the fire back on itself. Winds 5 to 10 mph, temperature of 86 to 90 degrees and a bit higher humidity will hopefully make for better firefighting conditions. 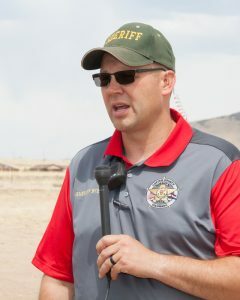 Incident Commander Paul Musser and Custer County Sheriff Shannon Byerly brought us the latest news on the Adobe Fire in their press conference Tuesday afternoon. 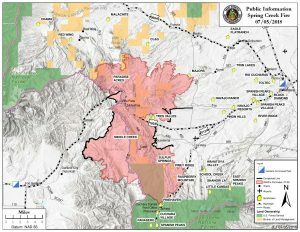 The Adobe Fire is located in the San Carlos Ranger District in the Northern Wet Mountains, Adobe Peak. As of 12pm the Adobe Fire has grown to an estimated 85 acres. The fire has progressed eastwardly. 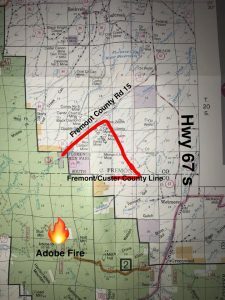 Preevacuations are still in order for South of County Road 15 in Fremont County to the Custer County line as well as the Custer County subdivisions of Adobe Creek, Trinity Ranch and TV Hills. 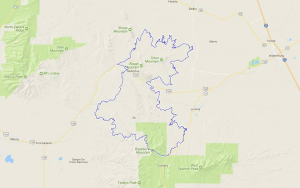 The USDA Forest Service Pike and San Isabel National Forests and the San Carlos Ranger District have issued a forest closure from highway 96 to Oak Creek Grade Road and along the West and East forest boundary lines. 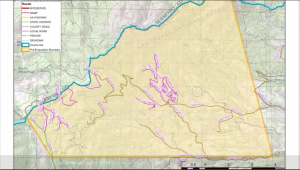 The following acts are prohibited on all National Forest System lands within the Adobe Fire Area on the San Isabel National Forest, Freemont and Custer Counties; going into or being upon the restricted area, being on the restricted roads and being on the restricted trails. 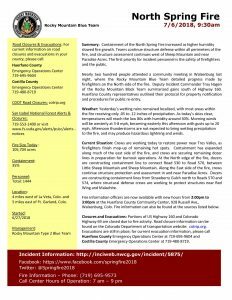 As of Tuesday evening, Highway 69 remains closed between Walsenberg and Huerfano county line. Here are links to two different live webcam views of the Spring Fire. 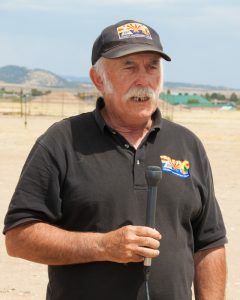 KLZR thanks KRDO TV and Viaero Communications for permission to share. The Adobe Fire was at an estimated 20 acres Monday afternoon, according to the Forest Service. Heavy Air Tankers and Single Engine Aircraft are being used in the firefight, as air supression is dropping water and fire retardant on the blaze. 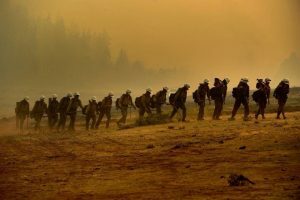 There are 100 personnel fighting the fire. Smoke is visible from Canon and Florence. 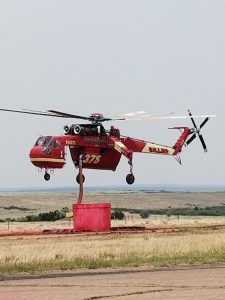 According to the Custer County Sheriff’s Office, the fire was discovered when a Forest Service plane was en route to the Spring Fire and saw smoke in the area at 2:20 pm Monday, July 2. This is in the area of Willow Creek above the Adobe Creek subdivision in Wetmore. Adobe Creek, Trinity Ranch and TV Hills Subdivisions have been put on pre-evacuation status. 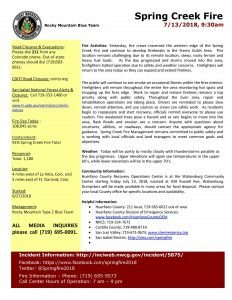 Additional areas have also been put in pre-evacuation notice, including Florence Mountain Park. Early reports incorrectly identified the fire’s location as Bear Basin Ranch. There are no structures threatened at this time. There is a daily 1pm meeting for evacuees of the #SpringFire that is held at the evacuation center located at the Blanca/Ft Garland Community Center, 17591 E Hwy 160. These meetings will provide resources to evacuees as well as a fire update. 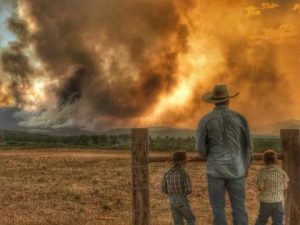 Elisa Livengood, Custer County Public Health Director, indicates there is a plan in place for Custer County evacuations should they become necessary. There are no evacuation or pre evacuation notices for Custer County at this time. 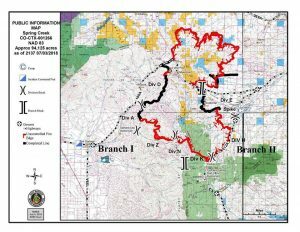 Here is a link to the official list of the 104 structures destroyed in the Spring Fire as of early Tuesday morning, July 3. Here is a report from KLZR friend Carole McNitt. These reports are based on official releases and on site firefighting reports. Please visit the official Twitter and Facebook sites referenced above for the latest official fire information. 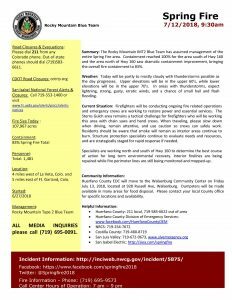 SPRING FIRE MORNING UPDATE TUESDAY 9:00 AM. This is my current update, from last night’s infrared flight, on the scene engine crew reports, mapping and some official fire details. 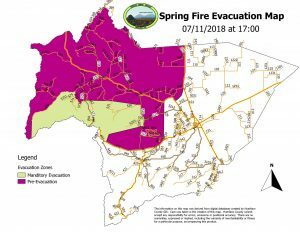 THE OFFICIAL MORNING BRIEFING WILL BE OUT SOON at Spring Fire 2018’s Facebook page: The Spring Fire was over 60,000 acres last night, and we will know better acreage later this morning. People seeing flames during the night from Westcliffe were seeing the east side of Silver Mountain burning with dense fuels. That is about 40 miles from Westcliffe. The fire burned to the South towards Cuchara, and is almost to Highway 12, so there were new evacuations there last night. On the north side of Highway 160, there were rumors Gardner was under mandatory evacuation but it was not, it was a momentary glitch in the evacuation statement. In the Silver Mountain area, the fire will reach the lower elevations today which should slow down forward progress in lighter fuels, and allow planes and dozers to put lines in. 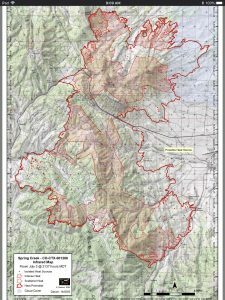 The fire did burn to the NE, which put the northern edge of the fire about 7.5 miles from Gardner, but it is not to Sheep Mountain yet, it is a mile or two south of Sheep Mountain. Today’s weather will prove to be another tough firefighting day, then things may improve as cooler temps and lower winds are on the way. 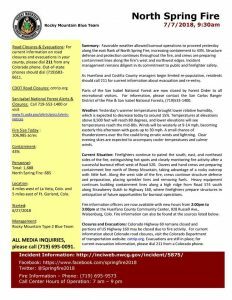 But today is a Red Flag Day, with winds 5 to 15, with higher gusts, winds increasing through the afternoon to 17 miles per hour FROM the SE (pushing to the NE), so that, along with the Highway 12 areas will be the two main focus points for firefighting efforts today. There will be a guided media tour today along 160, and the process of notifying homeowners of their property status has begun, on a one to one basis. Homeowners have been assigned their own PIO (Public Information Officer). KLZR thanks Carole for this report!